6) how to type using the keyboard. The advising spree lasted the whole of this week and by friday I was happy that I would be escaping from her non stop advice for the weekend.But when it was time for me to leave my workplace on friday evening, she offered me to give a lift to my place in her car. I was really worried because I knew that I had to survive her advice missiles throughout the car journey. Still I accepted her offer only because she had already promised to marry her daughter to me ( Her daughter is 3 years old now). Foreseeing the bright future that is in store for me because of her daughter, I agreed to her offer. To show my gentlemanly skills, I even told her that I would drive her car. She was all smiles and she handed the key to me. And soon we were driving back from our workplace and as expected , the advice missiles started. I was literally crying.But her daughter's image soothened me.While driving the car , I discovered that I had left my wallet in my work place. My wallet had all the money and also my drivers' license. But the brave human being residing within me, did not allow me to tell her about it, because if I had told her, I would have had to spend another truck loads of advices from her.Just to make it sure that I am the coolest driver around, I soon hit the top-most gear and the car rocketed to 100 kmph.I had my right eyebrow raised and I was at my personified best. 2) not wearing the seat belt. 3) not producing my driving license. The fine came to a lump sum of Rs.1500/- and that is when I turned towards the married aunt and told her in a husky voice," Hey! I do not have my wallet with me". 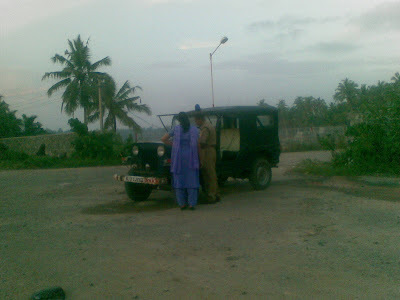 She stared at me for sometime and she got out of the car.She went to the cop and paid the fine.When she was paying the fine, the devil within me wanted to capture the whole situation on camera. I took my mobile phone and clicked a cool snap. When she returned, she never uttered a single word. I had never seen her keeping mum, all these days.Finally when I got down, I showed her the picture. She gave me that same dirty stare.Monday is just around the corner. Would the advice still continue? Hey, that's bad.....you never know when this lady wud turn out to be your only saviour and she wouldnt want to let go off her chance by then.Anyways, plz be careful... have a great time! wats de diff btw how to talk n how to talk to human beings???????? the jeep n cop look more like a normal cop rather than traffic cop... is it a story made up for the pic chriz??? use your sign name.. got you from the ip-tracker. mr.detective. 10 out of 10 for you. you are the only one to decode the mystery behind the story. kudos to you chellam..
you could be put in jail for thinking about a 3 year old! Please invite her to your blog ! she likes the post. she has even taken a pdf copy of it. what does pdf stand for btw? portable document format... she cudnt take an html layout of the same..
ha ha ha.. i loved this..
hahahhahahhahahahahahahahahahahahah hehehehheehhehehehhehehehhe hhohohohoohhoohhoooohohohoo hahahhahahahahhh heehehhheheheheehheh hhoohohohoohoohohoho... sorry for lol..